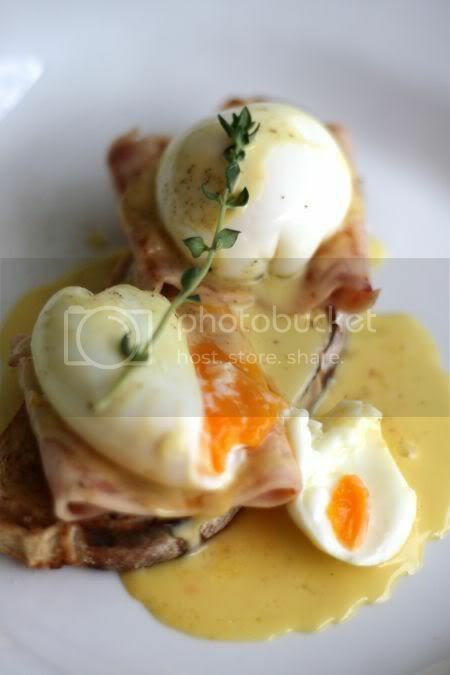 Long breaks are definitely the best time to enjoy lazy leisurely breakfasts. 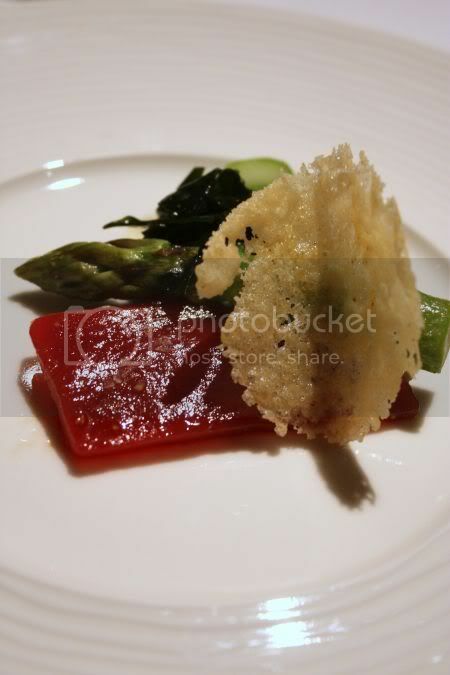 We discovered the newly minted delicious ingredients at Dua Annexe, when we visited Kirishima. Sporting the unmistakable turquoise blue coloured sign, this is a deli filled with a mix of gourmet ingredients and day-to-day items since it acts as a kind of store for the Dua Residency occupants. There is even a dry cleaner, baking and cooking equipments from Cuisipro, Cuisinart and Kitchen Aid here. Although they carry the same items like Bangsar Shopping Centre(BSC)'s new food hall, items here seem a little cheaper by a few RM. Weirdly enough, the people at BSC seem to have adjusted their prices downwards after Christmas, so the difference now is not as big as before. My favourite item was the Kshocolat chocolates - a premium chocolate from Glasgow. I went a little crazy over the white chocolate with lemon and pepper; a fantastic combination I must re-create in a mousse soon. Other brands they have are TWG Tea (teabags and pick your own tea selection from the jars), Butler's Grove with its selection of jams and preserves, Jones the Grocer (spaghetti sauce, preserved lemons, marinades and etc), Spanks and etc. 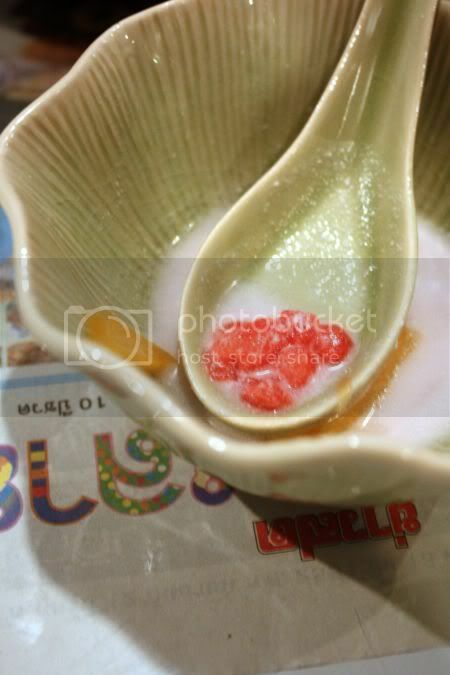 They also have fruits, fresh vegetables, meats, seafood, dairy products and etc. Take-away whole cakes are also available. At the moment, the small deli serves all day breakfast, plans are in the works to allow for lunch and dinner items where you pick from the meats selection to cook. We dropped by for a very late breakfast one day. The menu selection is not a lot and some items look familiar since we have seen them before in delicious' breakfast menu. Enjoy yourself with all the festivities, I know we will be with Maukitten's fantastic food for her annual New Year Eve's bash. Happy New Year everyone!! I have been very slack (head down in shame!) in posting.....very sorry, readers. Work and getting ready for the party for Xmas has meant, I abandoned the blog for a whole week. Yikes, very bad habit indeed. I don't even have pictures of the Xmas party spread, as I was so busy running around getting ready, collecting the turkey, preparing desserts the whole day (the lemon sabayon tart went down well plus the Valrhona white chocolate mousse) and etc, that we didn't get there in time for the party. During the long long break, we did get to relax and check out new places to eat, so I have a lot to blog about. On my list of to do places, has been Kirishima at the newly opened Dua Annexe, opposite US Embassy on Jalan Tun Razak. Located just next to Delicious, Kirishima is part of the restaurant chain, which also owns Ninja Jones and Yuzu at the Gardens, Mid Valley City. What made visiting them very attractive during this period, was their opening promotion discounts (valid till 31 December, 2008) - 10% discount for set meals, 15% discount for a la carte, 15% for chef recommended sashimi fish and 25% discount for shabu-shabu. Since we didn't get a booking at the hottest place in town at the moment (aka Tenji, the mega Japanese buffet, which you can eat till you literally roll out of the door) and it was fully booked during the long break, we opted for this instead. Eventually, we did 2 visits here, after we discovered the promotional prices and brought my mother here to try the food. For our first visit here, we zoomed in on the sashimi moriawase (7 kinds of specially selected fish) - really good stuff but don't ask me what they served since I am a dunce with Japanese names. I did spot salmon, scallop. clams, snapper and etc. 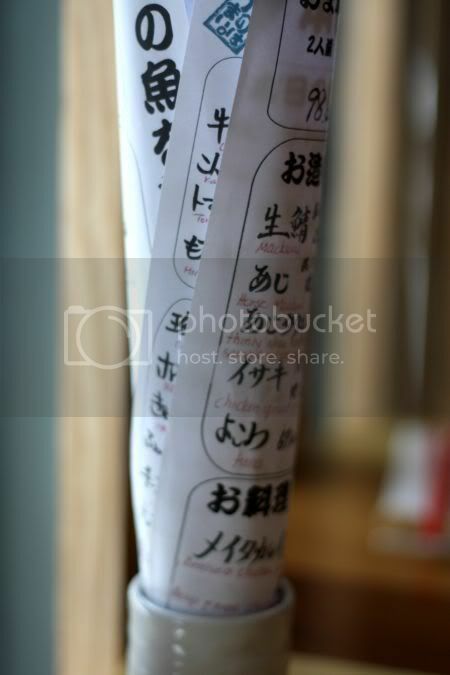 The next day, when a friend ordered the same thing, they were given a different selection, which had toro (tuna belly). 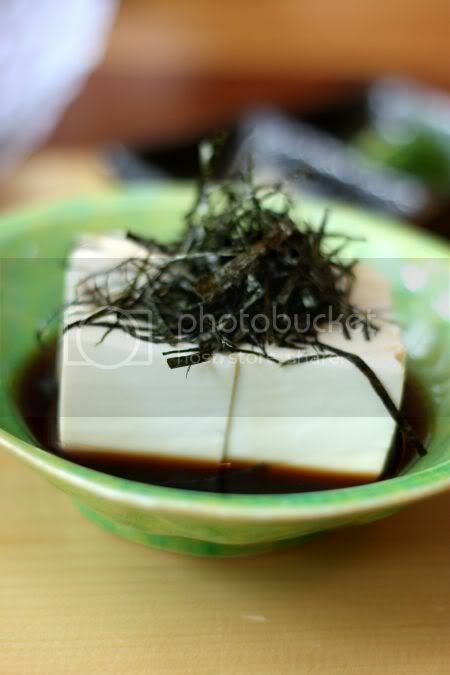 We also had a cold tofu, something I preferred compared to the agedashi tofu they serve here with eggplant. A wagyu beef sesame salad was added - nice and refreshing together with my favourite soup - dobin mushi. For our second visit here, we tried the sets - I had the really value for money Kirishima Gozen (RM48) and my mother had the Saba Shioyaki Set (RM25). My Kirishima Gozen set was packed with goodies ranging from a small portion of wagyu saikoro steak, 3 varieties of sashimi, 3 varieties of sushi, tempura moriawase, dobin mushi soup, assorted pickles, fried beancurd, a piece of chicken and fruits for dessert! Everything was very good except that piece of chicken, which tasted like it came out from the fridge hard and unappetising. My mother's grilled saba fish was also good - a pretty decent sized fish, which was juicy. Splashie Boy had a bigger version of Wagyu Saikoro Steak, which looked much better than the Wagyu Ishiyaki Steak. If you are around that neighbourhood, go check out that place, tucked at one corner. It sports chandeliers (weird in a Japanese restaurant), Japanese fabric curtains and lots of mirrors plus one wall of those salt lamps in front. 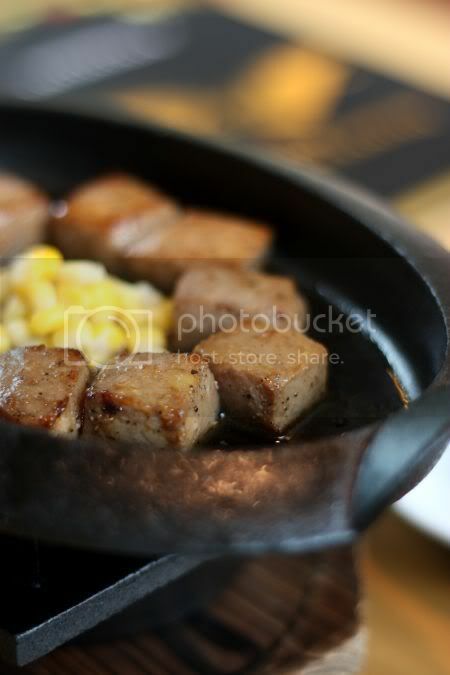 They also do an izakaya style spread for dinner (pick from the counter the food) and serve oden (a set for 2 pax) here. 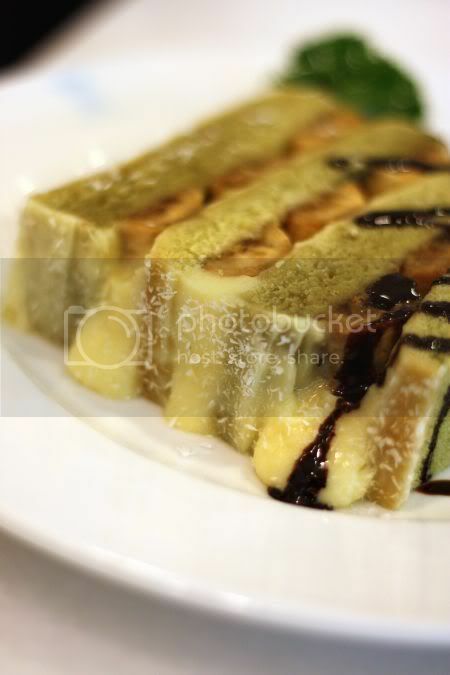 You may want to skip desserts here (the matcha tiramisu looks like an ordinary cream cake!) and head next door for Delicious' desserts instead. 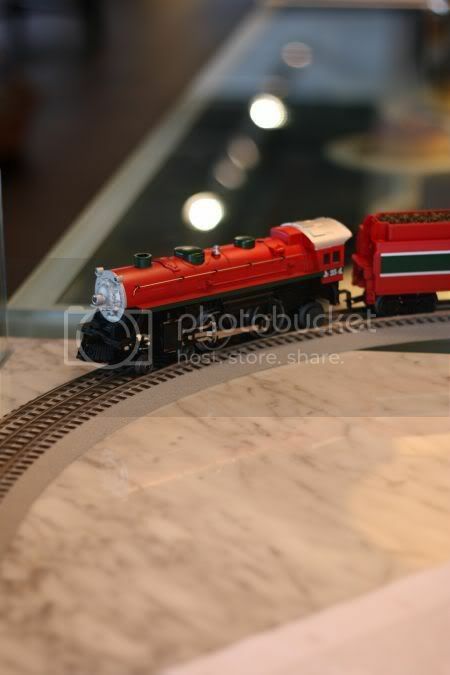 For more pictures of the other items we ordered, you can view the Flickr set. Sorry readers, but I have been extremely busy with work, hence the abandonment of blogging recently. Trying to finish off early, but somehow instead of the work finishing quickly, it seems to pile up more, as the days go by. Sigh!! Didn't manage to eat anywhere interesting this weekend but we did stumble upon an amazing find - Daiso at the Curve, right next to Nichii. For those who love the 100 Yen shop and its knick knacks, this is even better - about 4 shoplots of Japanese stuff i.e. crockery, cutlery, pet stuff, home decorative items, toiletries, car accessories, stationery and etc, prized at RM5 for each item. We went a little crazy there yesterday and bought a pile of stuff, since I am enamoured with anything Japanese. On to food, I stumbled upon this stall one day, after eating the char kuey teow next door. I eventually went back and tried the beef noodles. Run by an old man, it was pretty good stuff. Not knock your socks off stuff but decent enough, as you could taste the beefy soup. He was also pretty generous with the beef, tendons and stomach bits so I was quite happy. 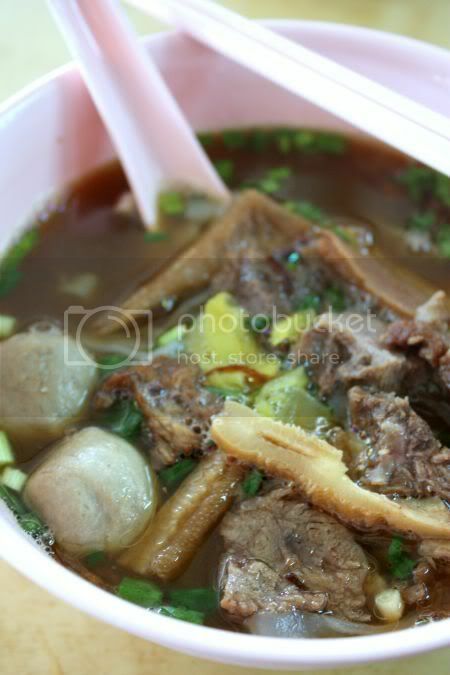 What I also observed at this coffeeshop, the pork noodles were also very popular hence I ordered it for my next visit. Not sure why people order it as it was so dissapointing - full of soy sauce until the sweet taste of the pork broth was killed to death. Don't order it, instead save your tummy space for the other pork noodles place at Restaurant Ten-Tien Fatt, further up the road. A quickie post, as I realised I am super dead tired after a long day fighting with traffic, crowds in the mall and etc. I have been faithfully ticking off places to try from the same guide book that led me to the wantan mee place. Next was the Lam Mee stall at Restoran Mei Sin, Imbi. To be honest, if the guidebook didn't mention they sold Lam Mee, I would have ignored that stall as it seemed to be more popular for its curry mee. While the Lam Mee didn't wow my tastebuds for me to call up the whole world to try it out, it was still pretty decent stuff. What I liked about it - it felt very homey and luckily, not overdosed with MSG. The chili sauce served with it was suitably sour and spicy, adding a needed kick to the noodles. Overall it was a decent bowl of noodles to partake, if you are around the area. However if you plan to specially make a trip here, I suggest May King at the busy streets of Pudu instead as despite the commericalization of that place, the noodles taste much better there. Read about other stuff from Restoran Mei Sin here. 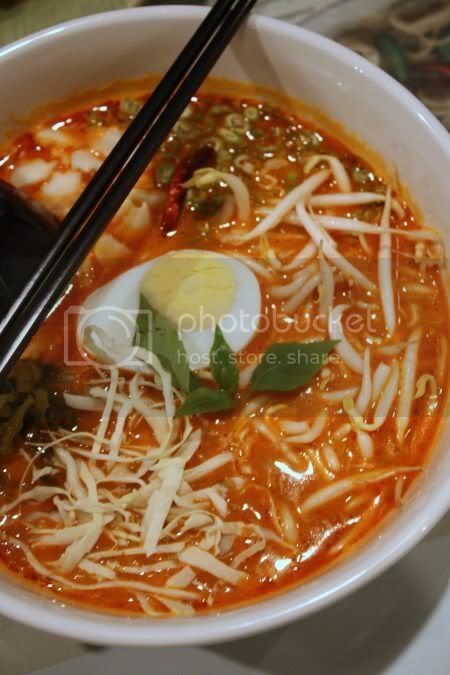 And since we are talking about Lam Mee, has anyone tried the new place at 1 Utama, near Kluang Station, called Lameeya (I think)? Looks interesting but it was super empty today while Kluang Station was packed with people. 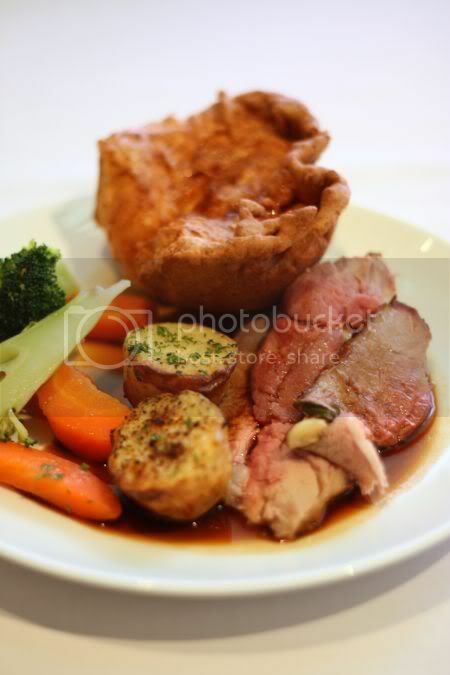 One of my fondest memories in England was the Sunday roast lunches. No matter how awful the meals were during the whole week at my dining hall (I had to stay in a catered hall of residence for my first year), I always waited in anticipation for Sunday. It was a day to laze around, catch up with assignments and savour one of the best meals - roast beef, lamb or chicken with lotsa gravy, roast potatoes and vegetables. It makes up for Sunday dinner, which is usually a let down though (since the cooks go off to church) - cold cuts and salad. We did the new Tastings menu by Chef Haffiz quite some time back and was very impressed with his Slow Braised Daube of Beef Cheeks. Just imagine fork tender beef that melts in your mouth paired with a smooth potato puree - simply heavenly stuff! I didn't blog about it, as I wanted to do a trio of tastings - the dinner menu, the Friday lunch menu (4 course meal with wine for RM120) and the Sunday roast lunch. Work and everything got in the way, so I didn't get my chance until yesterday to try the Sunday offerings. Since we were at KLCC (for the PIKOM fair, just like the whole world as Splashie Boy was stocking up IT stuff including a terrabyte hard disc for my Xmas pressie! ), we decided to try this. We didn't regret stepping in here and trying the buffet even though we tend to avoid buffets. It may not be a lot of food but the taste of certain items blew us away. I've heard raves of Chef Haffiz's soups before from a friend who tasted it during his Friday lunch offerings, so I was keen to try his garlic aioli soup. 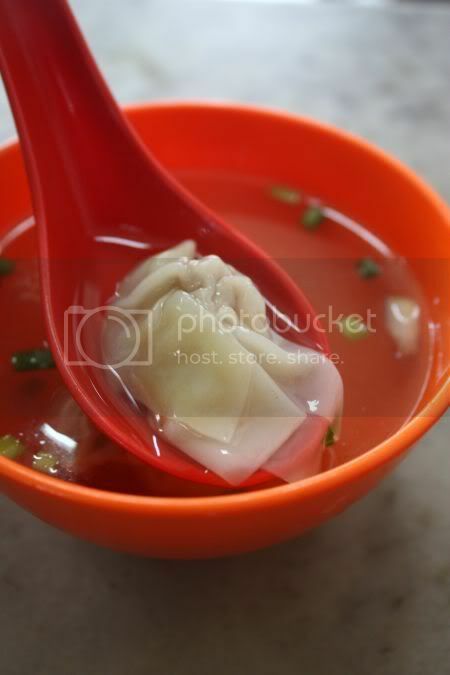 Gosh, it was the best soup ever for me - so smooth and rounded, with the distinct taste of garlic. Not overly creamy and heavy like other soups and simply so fantastic, I felt like drinking the whole pot! There is an array of appetisers - salads (caesar and potato), cold cuts and vegetables, fish cakes and a small platter of assorted maki and sashimi. We didn't want to eat much, hence we only picked a few makis to try and the sashimi (a mix of salmon and another white fish I was not familiar with). 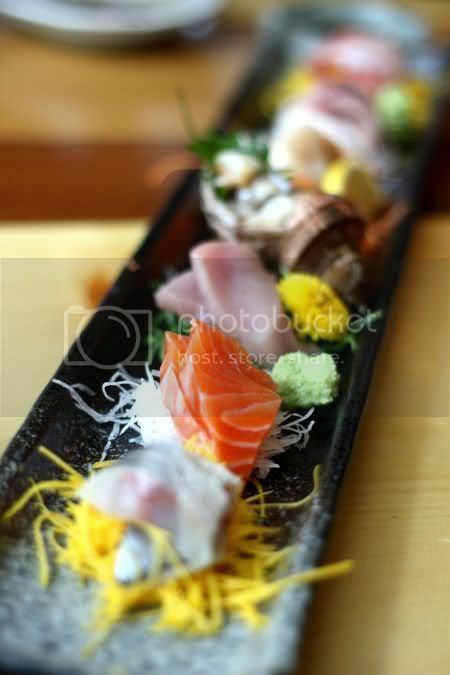 Makis were good - with a hint of spiciness within the roll and the sashimi was also nice and fresh. Both of us were leaving tummy space for the main event - the roast meats. Splashie Boy came back with a fully loaded plate - slices of roast lamb, a chunky Yorkshire pudding, vegetables and roast potatoes. Even though there were other selections - roast beef and chicken, we were recommended the roast lamb as it was nice and tender that day. Splashie Boy gave his thumbs up hence I had the same items with lamb jus, mint sauce and a little wholegrain mustard on the side. Oh man, it was damn good stuff - the lamb leg was stuffed with garlic cloves, hence you had the tender meat with slightly softened garlic bits. I also loved the roast potatoes. Usually the ones you get are hard and overcrisped - this version was slightly fluffy. Although we would have preferred roast beef with our Yorkshire puddings, we were warned that it was a little tough today (we tried and they were right). 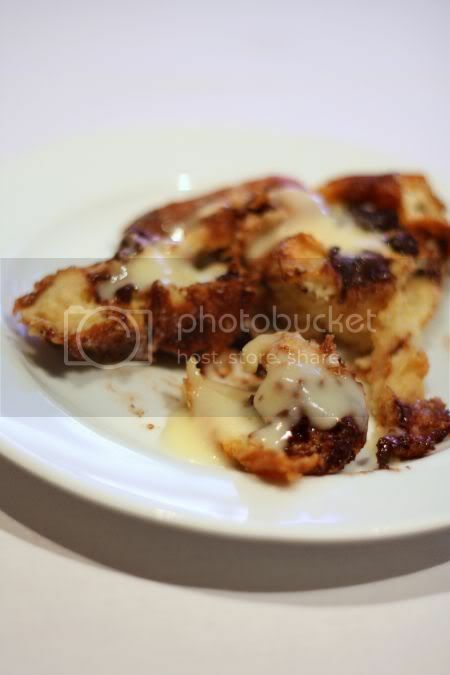 To cap off our great meal - we had the bread and butter pudding. Sprinkled with chocolate bits, it was also delicious, not too heavy on the custard but still yielding a rich taste especially with the chocolate bits. If you love solid English Sunday lunches like both of us, do visit Chinoz and who knows, you may see us both enjoying the lunch almost every Sunday here. Trust Splashie Boy to find a new Tex-Mex place to try out especially since it is his favourite food. He spotted this place when he explored the new Giant hypermarket at Kota Damansara last Friday, hence he brought me here yesterday. The huge hypermarket houses quite a lot of food - J Co Donuts, Wendy's, Kiliney Kopitiam, Korean BBQ Chicken, Noodle Station, JM Bariani, KFC, the yet to open Otak-Otak place (which is linked to Pick & Brew) and etc etc. The no-frills restaurant is painted dark green including the ceiling (which is covered with aluminium zinc) and a few Mexican touches in the form of black and gold somberos on one wall. 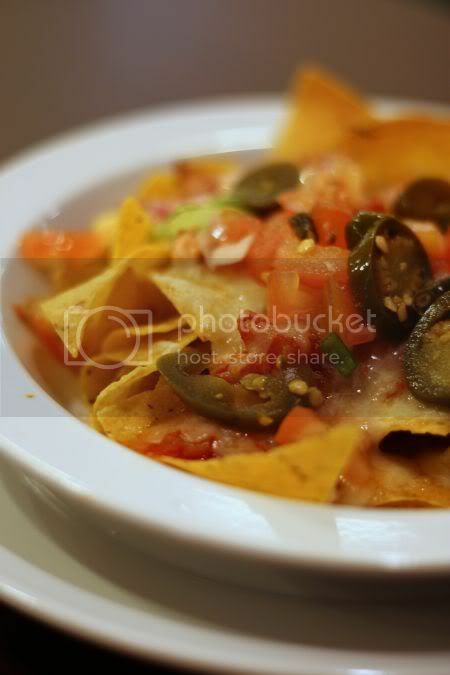 The menu is quite simple - a few varieties of nachos with different toppings, quesadillas, tacos, main meals with Mexican rice, fajitas and etc. We ordered nachos of course - the chili beef version but instead we were served the chicken variety. Kinda weird but I didn't realise the mix up, until I just looked at the receipt since I didn't order. Anyway, we weren't complaining as it was tasty stuff especially with the not spicy jalapeno chillies on top. We were given a pot of sour cream to dip the nachos in, which we almost finished up. The place here reminds me a little of Chillis, as kids below 12 years old get to eat free (so there were loads of families eating here. Am not sure if any other terms apply though, as I didn't read the fine print) and they bring the tray next to your table when they serve your main meals. I ordered the combo fajitas - a mix of chicken and beef strips that topped onions and sliced capsicums, which arrived sizzling hot that I even managed to capture the smoke arising from the hot plate. With it, they served three soft tortillas, sour cream, grated cheese and chopped tomatoes. We also ordered a side order of avocado. We had to pile the meat high on the tortillas since the platter had more than enough to go around. Splashie Boy ordered the chicken tacos, which were also good - not dry and slightly juicy. His plate was a little plain though with just french fries with his taco. French fries weren't anything fantastic either. We both enjoyed our meal and definitely return to try more stuff again. 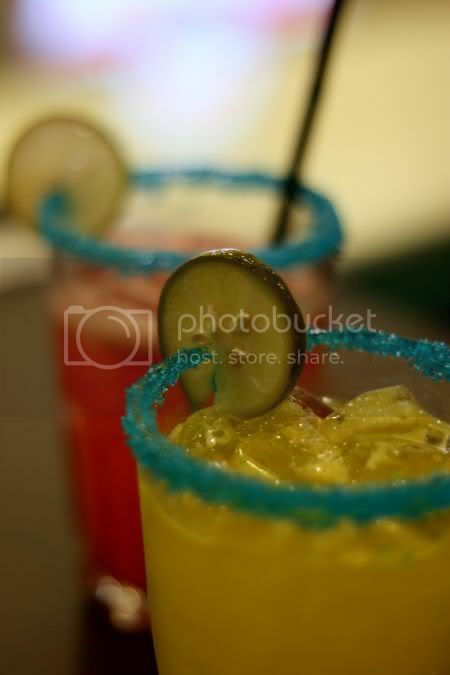 Oh, they also do non-alchoholic margaritas here - a bit weird especially if you prefer the other version but it is still very refreshing, tangy and extremely pretty with the blue sugar coated glasses. I never tire from exploring Kampung Baru - it is like every nook and cranny there has good food, if I look hard enough. For me, the contrast between the old kampung houses and the modern skyscrapers always reminds me of how far we have come in development. Parts of the village has gone through some sprucing up with new pavements but to me, it is still a great place to search for Malay food. 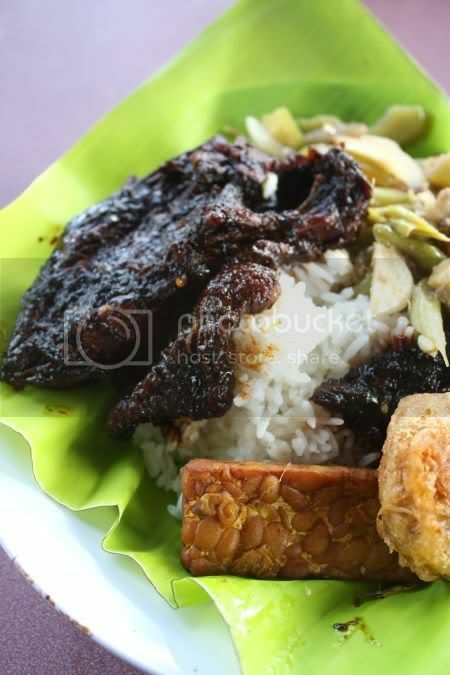 We wandered there last weekend, to search for this Nasi Ambeng stall. 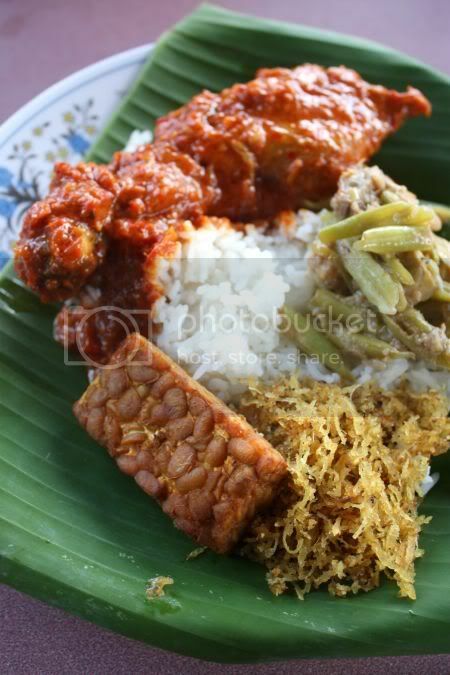 A Javanese dish, Nasi Ambeng or Ambang is usually served during weddings and parties (aka kenduri). Traditionally, you place 4 portions of rice, fried noodles, chicken, serunding, tempe and etc on a tray lined with banana leaves. Everyone is encouraged to share this platter. 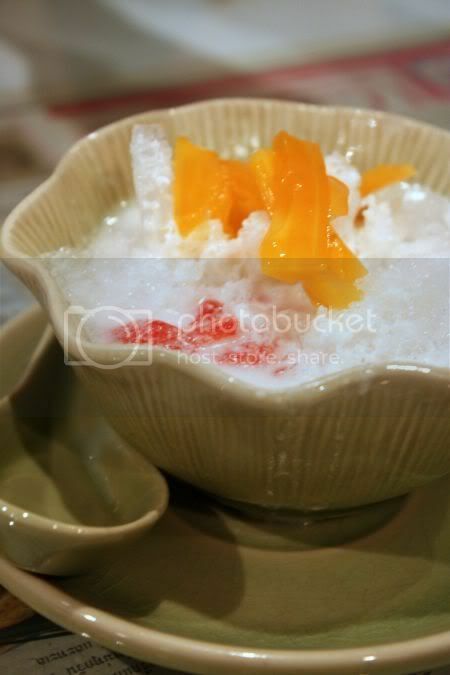 Nowadays, the stall owners serve a different variety - single portions that you eat like Nasi Campur (mixed rice). Some varieties also see them packed like nasi lemak bungkus except the packets are larger. Here, the rice is packed tightly with all the accompaniements in a banana leaf, which infuses the rice with a fragrant aroma. 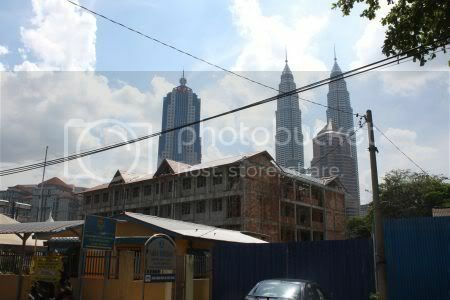 Located along the quieter stretch of the main thoroughway of Kampung Baru i.e. 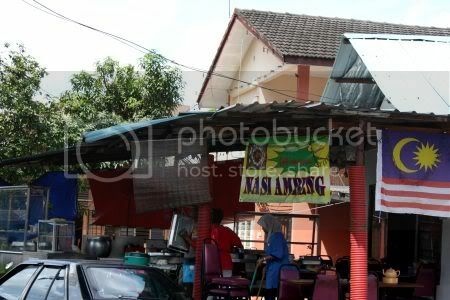 Jalan Raja Muda Musa, it is not hard to spot this stall within a house as they have a banner proclaiming they sell Nasi Ambeng. Only available from Friday to Sunday during lunchtime, you get a lovely view of the Petronas towers, if you sit there and dine. We had a choice of fried tempe (cut in chunks versus thin slices), fried tofu, serunding kelapa, ayam kicap, ayam masak merah, green beans fried with tempe and tofu - a kind of sayur lodeh, ikan keli, bergedil and etc. This place also serves lontong every morning using most of the same ingredients - sayur lodeh, tempe and serunding kelapa. I loved the chicken here as they use the tougher ayam kampung for their dishes. A little tough but still much better than the mushy and soft type of meat you get from antibiotic injected chickens. The meal was very satisfying and pretty reasonable - two portions with drinks cost us less than RM11. While the food was not totally genuine, it was still a very good meal. Last weekend, we did a little retail therapy - a little hard to resist especially when every shop you walk into was having those magic words - "sale" that seems to make you reach deep into your wallet. After a long day zipping through town from Kampung Baru, KLCC, Pudu and finally Pavilion, we settled for a teatime snack at this cafe nestled within the department store. 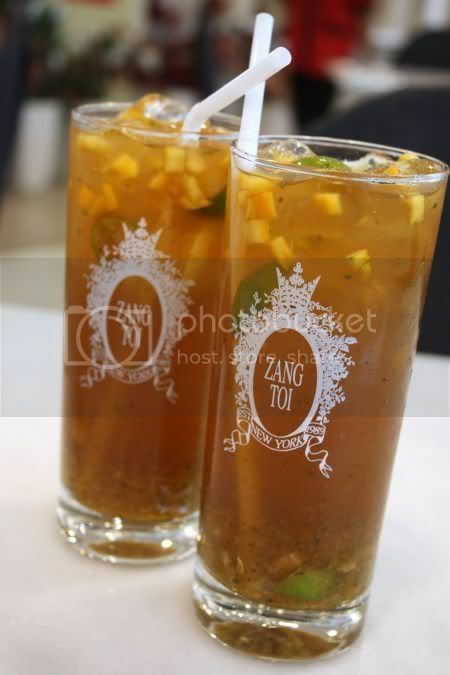 even the glasses that fill a tangy fruit tea punch (One for RM6+) are "labeled"
Unlike the other outlet in Sungai Wang Plaza, this place was nice and bright - all white with chairs dressed up in grey outfits with the Zang Toi label. Opened by the ever famous Malaysian designer - the only one who has made it big overseas, the cafe serves pretty good food. From what we spied at the next table, their set meals are definitely good deals (the sandwich looked enormous). Unfortunately since we were quite full, we opted for drinks and a snack instead. Since we needed a cool drink, it was their tangy fruit punch we ordered - a delicious concoction made from tea and loads of diced fruits to give it extra flavour. Really refreshing stuff that I could have drank more. 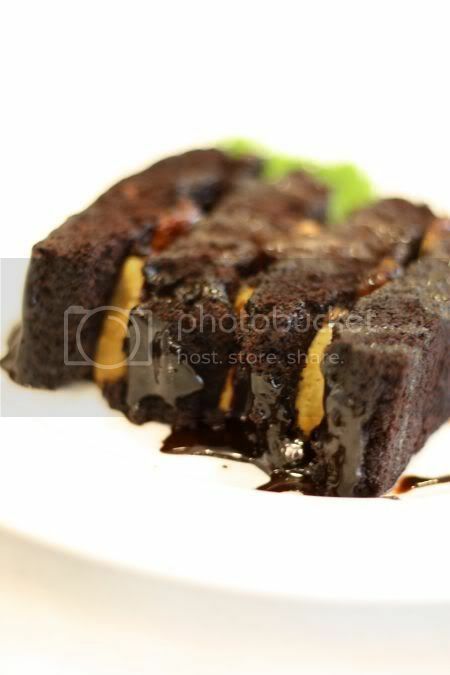 A must-have is the chocolate banana cake - rich layers of chocolate cake with sliced bananas. What I loved about the cake is it is rich and chocolatey plus the bananas are just ripe. 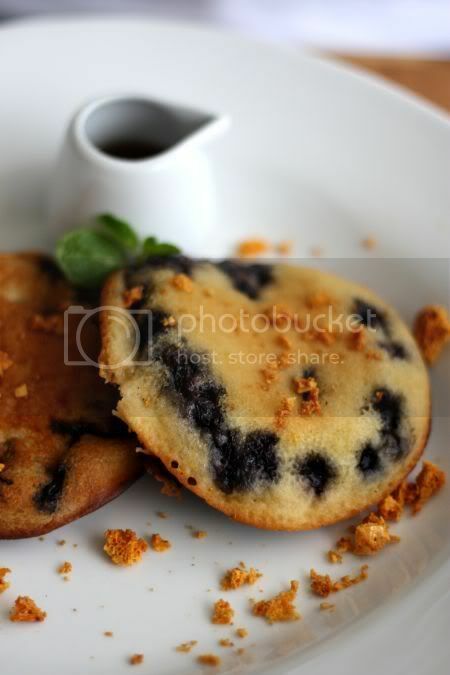 You can opt to eat it with ice cream but this time round, we decided to eat it a la mode. Another version they have of this cake is made with pandan sponge cake - very delicate flavour drizzled with a cream sauce and also filled with banana cakes. Unlike the rich chocolately taste of the other cake, this one was more subtle and will suit someone who prefer a lighter taste. 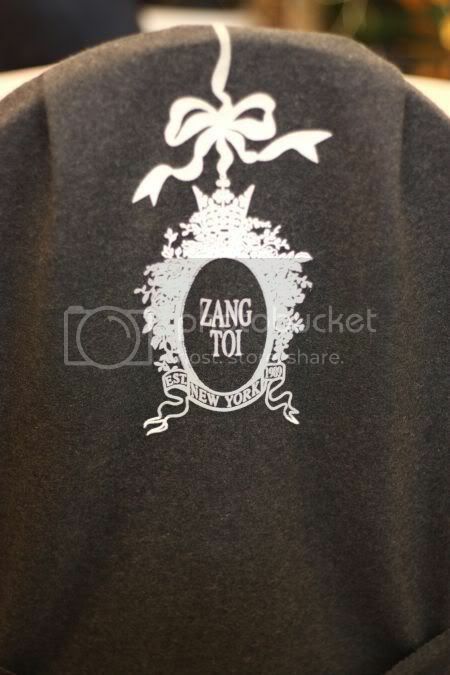 For fans of the label, they also sell decorative flowers, mirrors and leather items to keep stationery, photos and etc. around the cafe. Originally the plan was to sample hairy crab, which is now in season BUT when at least 3 people who are all foodies, come and tell you within a span of 2 weeks, that this newly opened (about 2 months) is very good, you know you have to visit it straightaway. Hence on a rainy night, we discovered porky heaven (only for us, and obviously porky hell for those piggies!). This place serves the popular Thai street food, braised pork trottter - some thing unique you don't see in other places. 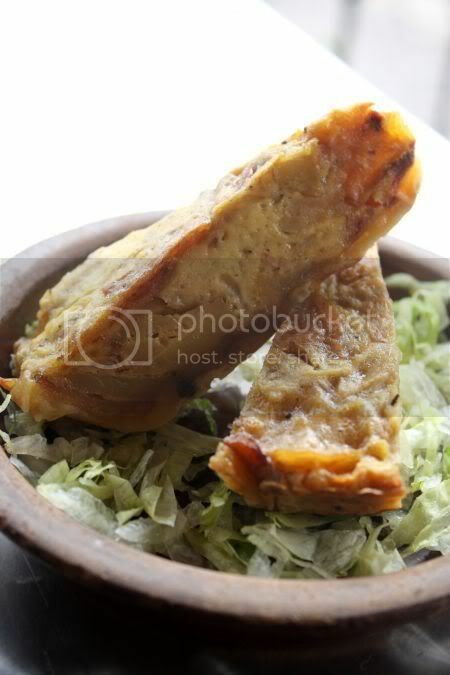 However, this version is not entirely like the one served in Thailand - the sauce is thicker and darker and instead of using salted cabbage (ham choy), they use the preserved mustard cabbage (mui choy) here. 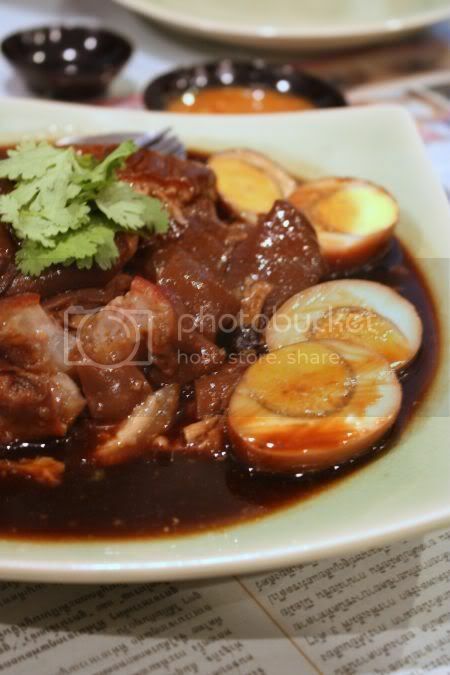 Since I have never tasted the one in Thailand before, this information was shared to me by Precious Pea - the expert on the Thai braised pork trotter version. Nevertheless, this version is still very delicious, decadent (all that melt in the mouth fat!) and great with copious amounts of white rice. 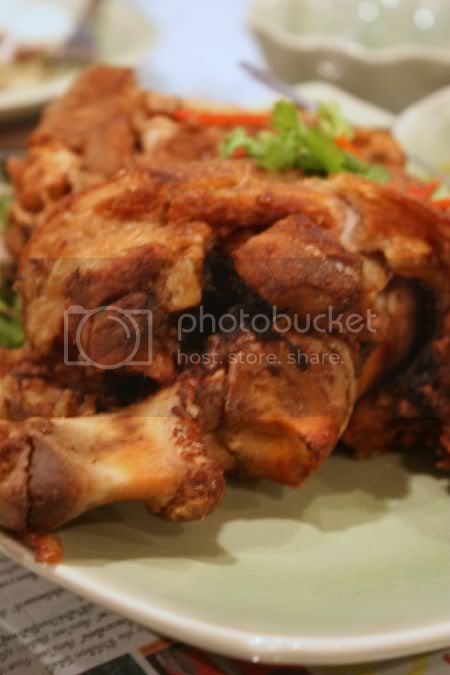 Another yummy treat is the crispy pork knuckle, which we enjoyed with the slightly spicy green chili sauce and a sweetish thick soy sauce. Eat the skin as it is definitely the best part since it is nice and crunchy. We also enjoyed the Thai Laksa - not as thick compared to the one I have eaten before at the Gasing Hill stalls but still very aromatic and rich with coconut milk. The shredded mango kerabu came topped with pieces of salted egg and crunchy small prawns. Unlike other places, the mango seems to be drenched in quite a lot of dressing here and has lost its crunch. Luckily the prawns give the crunch needed. The menu here is very non-halal and even the vegetables get a dose of pork belly slices. We were practically rolling on the floor after that full meal hence we shared two desserts from the menu - the classic red rubies dessert with water chesnut and nangka. Pretty good and here they use fresh coconut milk versus those places that replace it with the packeted variety. 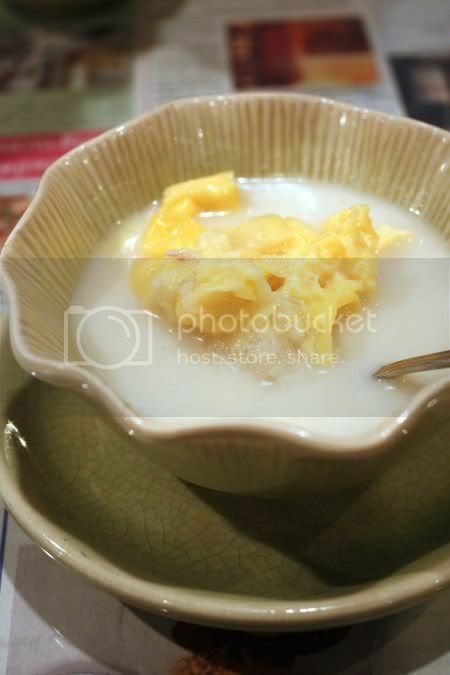 However the winner for the desserts section was the strong tasting but very creamy durian glutinous rice. A little rich for dessert especially after a full meal but try not to miss it, as it is very good especially if you love durians. 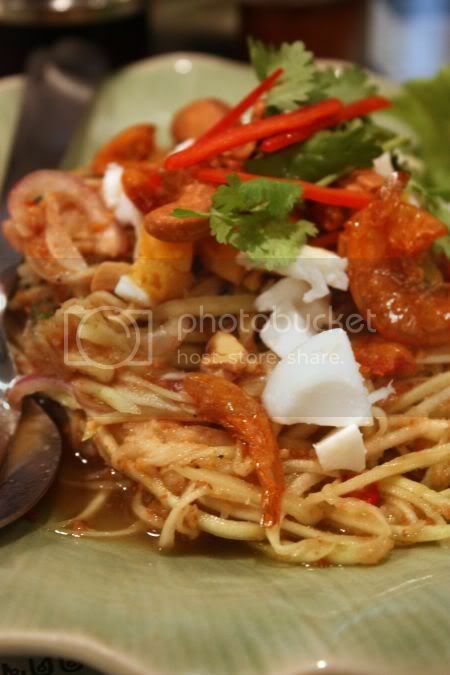 Since the crisis in Bangkok seems to be ongoing at the moment, this is definitely the next best thing to get your cravings for Thai street food satisfied. I'm still going down my list of places to eat in Subang Jaya..slowly but surely. 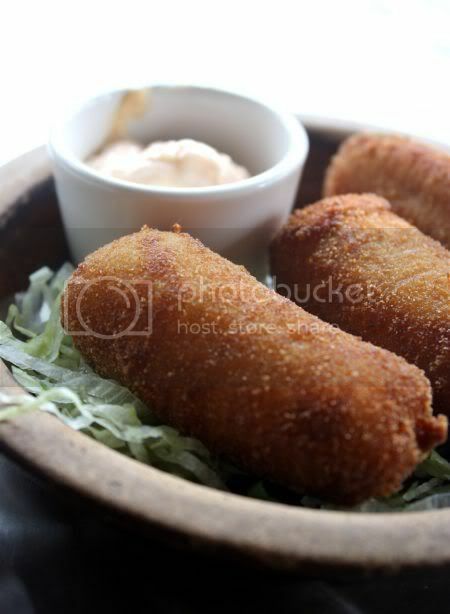 One of the places that popped up on that long list was this Spanish restaurant. Not a new place, this was located in the quieter Taipan area near the branch of the ever famous Ah Koong fishball noodles. For our first visit, I had zero expectations especially since this place was very quiet (only another table besides us and some people sitting at the bar), even though it was a weekend. In fact, I almost wanted to bolt out of the door but the restaurant was pretty cosy albeit a little cramped inside. I quickly changed my mind when I started tasting the tapas we had ordered before our main dish came i.e. the paella. Being cautious, we decided on two tapas dishes for the night - lamb meatballs (always a must with Splashie Boy) and soft shell crab. 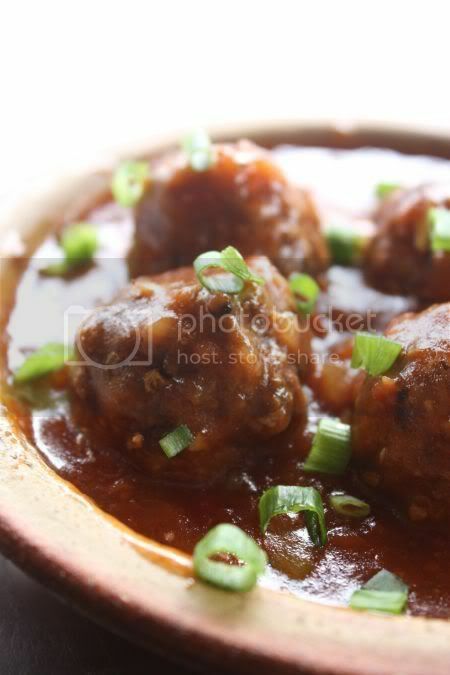 The meatballs were juicy and tender. 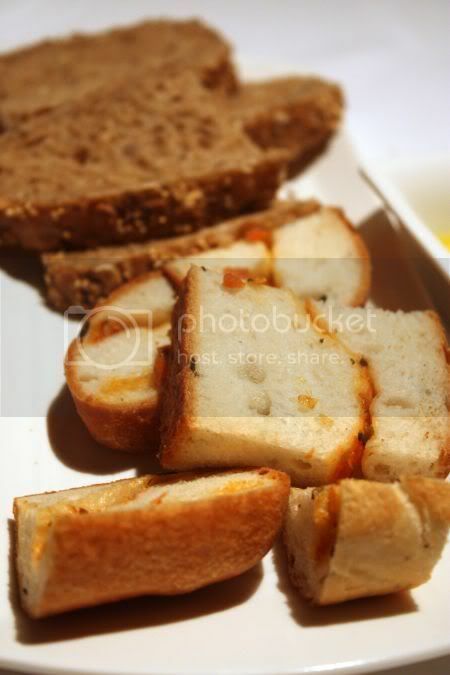 Served with a divine tomato herb sauce, we wiped clean the plates with the bread given on the side. I also loved the soft shell crab - nice and crispy and delicious when paired with the creamy mayonnaise. 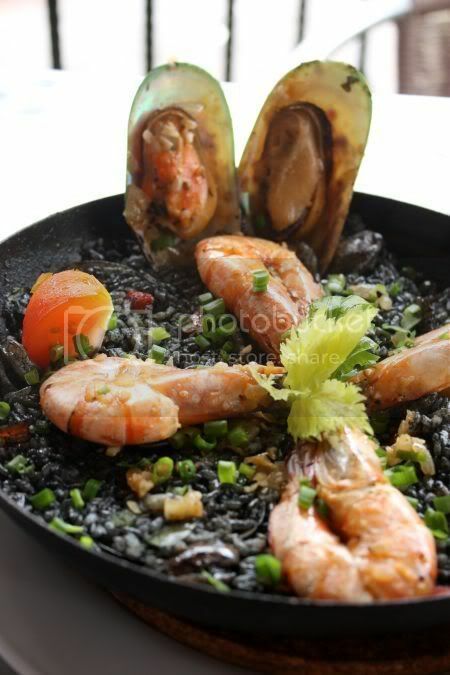 For our second visit here, we decided to go for the paella set for 2 (RM80++), which came with 2 tapas dishes, paella and a dessert to share. The tapas dishes this time round were the chicken croquette and Spanish omelette. While the taste of these two tapas dishes weren't as fantastic compared to our previous visit, we did enjoy them as they were a light prelude to the main event aka the paella. I have a love/hate relationship with paella served in Malaysia - most of the places I find just make it too mushy that ruins the whole dish. Here, they cooked the rice just right with taste and texture and best part of it, they have a nice layer of crust underneath. To be honest, it was my first time encountering a crust under my paella that I thought they got it wrong. A quick wikipedia check indicated that this crust is highly sort after - kinda like the crust you get from claypot chicken rice. Hence, I have been hooked on this version ever since. I love the squid ink version, with the clams mixed in to give it extra flavour. And since we knew the crust was something to look forward to, we scraped all those crusty bits and ate them too. Simply heavenly stuff. 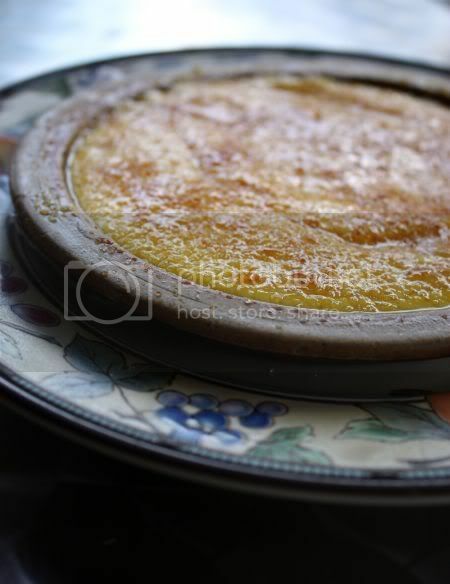 For desserts, we had a choice of crema catalana or almond tart. We went for the Spanish version of creme brulee. Very creamy and soft, I thought it was extremely rich. Luckily we only had one small portion to share as it was a very filling meal. Overall verdict for this place - we like it a lot and will definitely keep returning to try other menu items. Service is also very good and attentive but then, most of the time when we dine here it is pretty empty, so it has not been tested much. Upstairs the restaurant, there is a bar and it seems on Friday nights, they have salsa dances here. Sounds very happening. I was eager to try this place out when I picked up a recently published guidebook that proclaimed it to be one of the best wantan mee stalls around. Hence one day, I drove around the busy stretch of Sungai Besi (which is now a highway) to look for this coffeeshop. While most regular patrons parked in front of the shophouses (next to the shop is an abandoned car showroom), I chose the safer way and went for the side road next to it. It is amazing I never spotted this place considering I have driven past this road/highway a thousand times. The place is very old school - white ceilings with whirling fans, old marble tables with wooden chairs and from what I gathered from a framed Chinese newspaper extract, they started in 1969! Two signs head the shophouse - an old black wooden one calling it Feun Kee and a larger one calling it Fun Kee. There is even an old California car plate with Fun Kee on one of the front shelves. The place seems to have their own set of regulars - workmen parking their lorries in front, people arriving on luxury vehicles complete with a driver or office workers from nearby looking for a quick lunch. Here you can order wantan mee with various toppings - the old school char siu slices tinged red, braised chicken feet with mushrooms, braised pork ribs, poached chicken, stewed beef and fried chicken only on Thursdays. 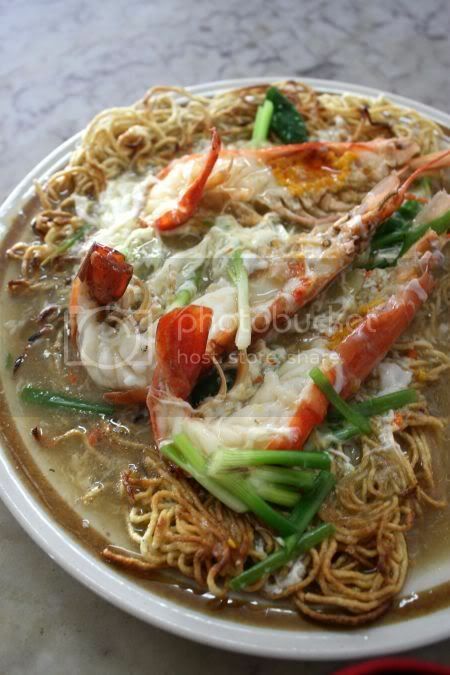 They also deep fry the wantan noodles till crisp and top it with freshwater prawns or use it to make Cantonese style noodles and etc. One day, I saw this other table ask for the deep fried wantan noodles topped with just small prawns and vegetables. Looked crunchy and yummy. 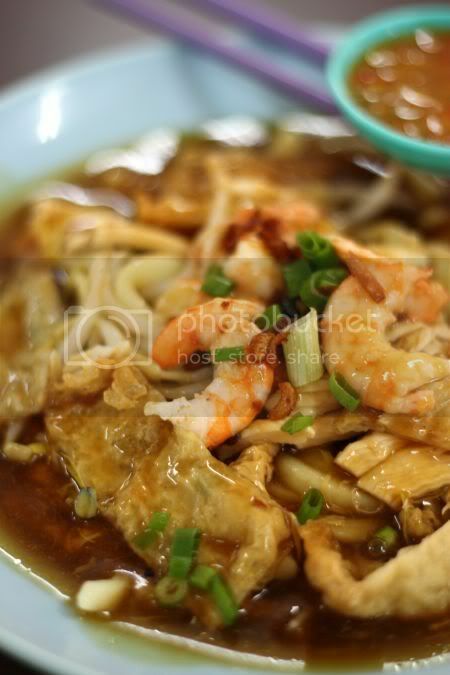 I really like the deep fried wantan noodles - crunchy and delicious especially after it has soaked the sweet prawny gravy. While the gravy here is not as eggy as Pan Heong in Batu Caves, I like the fresh taste minus any MSG. 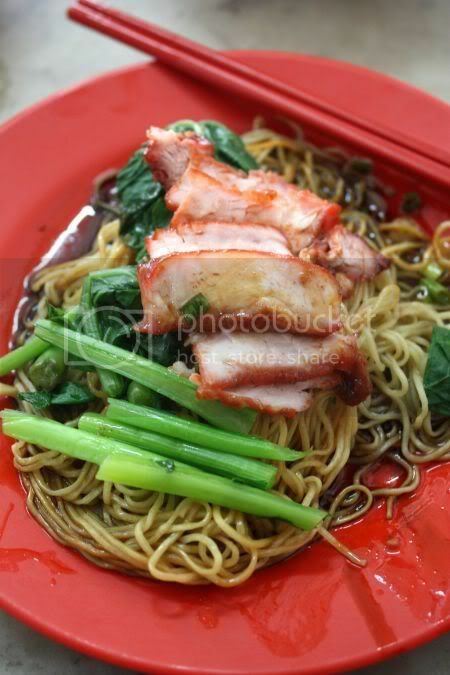 The regular char siu wantan mee was average tasting probably because I don't like the old style red coloured char siu slices. Even though it was tender, I kinda crave the sticky black version. 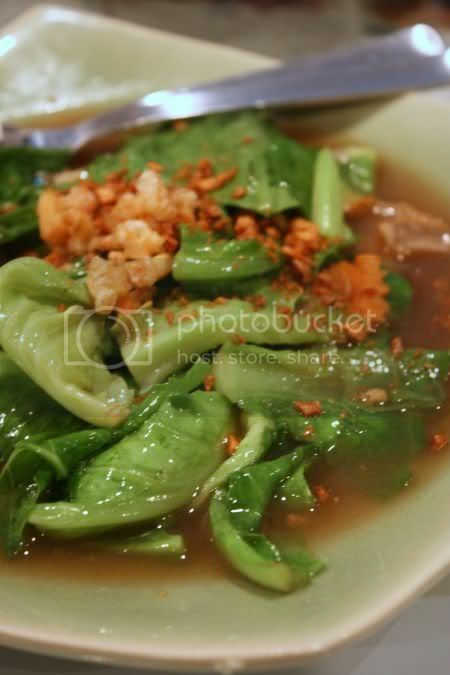 I liked the wantans they served the noodles with as it has a slight aroma from dried sole powder used. 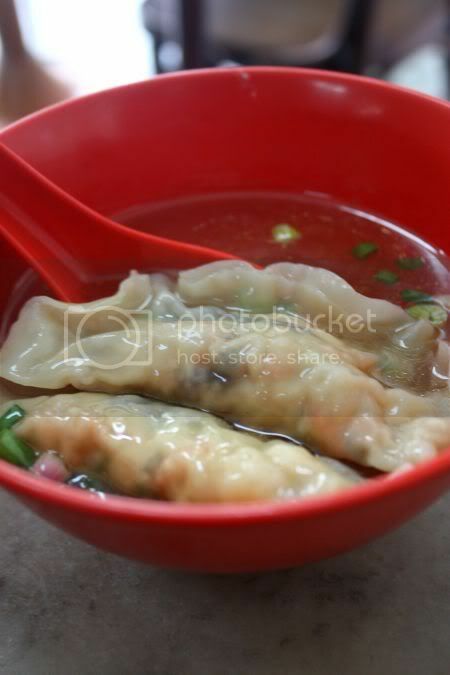 The dumplings are also delicious - not super crunchy but filled with water chesnuts, carrots, wood ear fungus and prawns. This place may not qualify for the best wantan mee place in town but I reckon it will remain a favourite for me whenever I hanker for crunchy deep fried wantan mee. Ever since Cilantro closed for renovations last year, there was a void in the fine dining scene. When rumours started on their sister restaurant i.e. 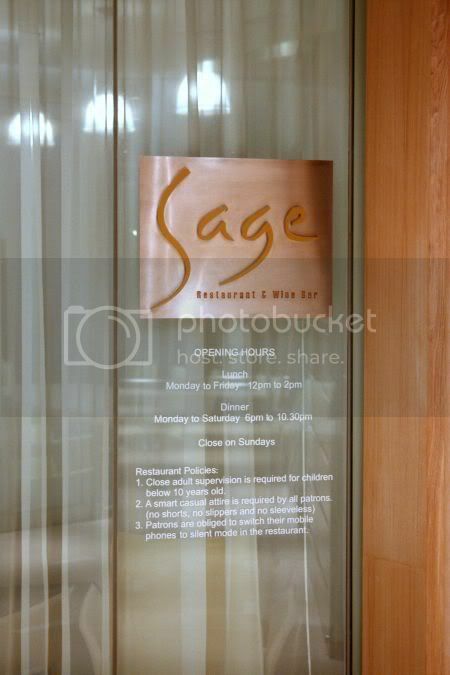 Sage was opening, everyone was waiting with a bated breath. First it was scheduled to open its doors in July. However, July came and went but still there was no sign of it opening. Then it was pushed to another date and another until it opened with very little fanfare in October. However word got around that the place had opened and without any publicity....everyone in town was buzzing about it. Seems news of it opening even got down south, as my sister was asking me what was Sage all about, as her friends were raving about it. Splashie Boy and I decided to check the place out one night on the pretext of celebrating one of those forgotten occasions. Being together for so long, means both of us have amnesia when it comes to celebrating birthdays, anniversaries and etc. At the moment, we run a virtual "buku 555" on presents and celebration dinners we keep missing between both of us. Based on my ledger, my slate is clean but Splashie Boy's ledger still owes a couple of debits in terms of Valentine and birthday dinners and presents. We settled down to our choices - the Gourmet Dinner for Splashie Boy while I decided to go for the degustation menu. While Splashie Boy was veering towards his favourites like beef rump, I did steer him to try the highly recommended Cold Fedellini with Hon Maguro & Bottarga for his appetizer. 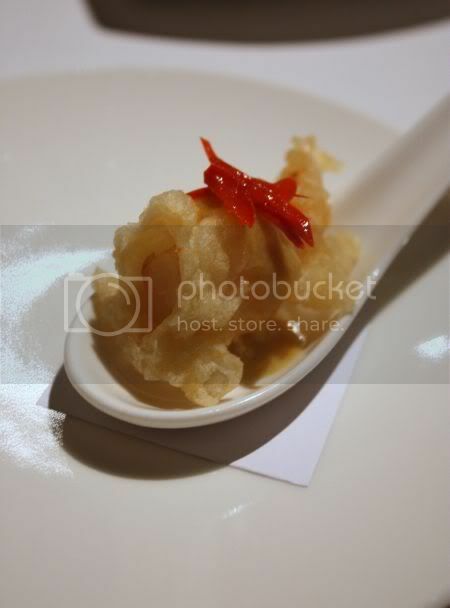 We started with a little amuse bouche, which I thought was kinda weird - tempura prawn! Didn't taste like any kind of tempura I have eaten before and it felt very ordinary tasting. I was a little worried after eating that, expecting the worst to come next. Luckily we were saved by Splashie Boy's chef special of the day - very fresh sashimi garnished with a piquant yuzukushou sauce, green chillies with yuzu juice. 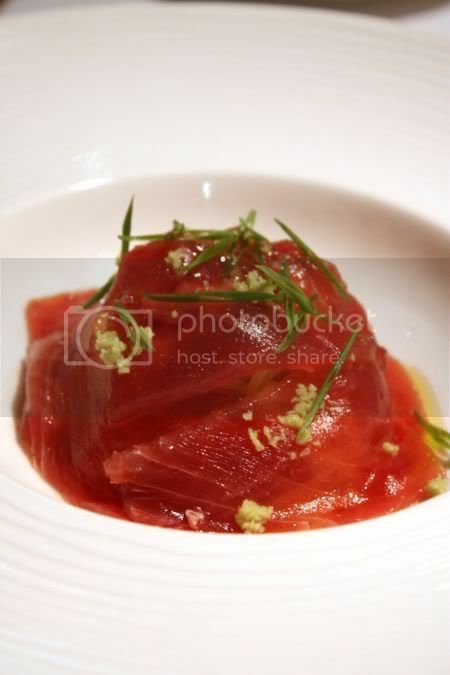 My first course from the degustation menu - the blue fin tuna carpaccio may have been a classic one but again the fish was very fresh. I loved the crisp parmesan cracker served with it - must make these one day as I remember they're pretty easy to make at home. Most of the dishes have Japanese elements in them - a touch of konbu seaweed on top of my asparagus served with the blue fin tuna, yuzukushou - a type of paste made from yuzu and green chillies with my Wagyu beef, a type of turnip known as kabu with my foie gras, gingko nuts known as ginnan with my pan fried fish and etc. A mix of Japanese and Italian - you find pastas and common Italian ingredients like bottarga and parmesan incorporated here. 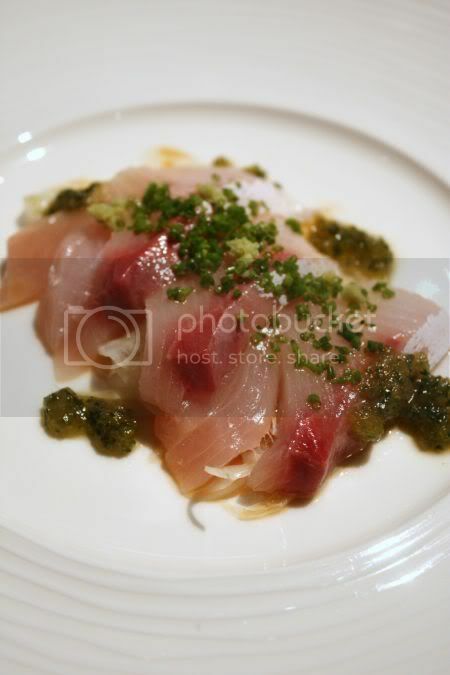 Splashie Boy's appetizer, the cold fedellini (a type of pasta) with melt in the mouth thin slices of hon maguro (tuna) is tossed with bottarga, a roe considered as a delicacy by the Italians. 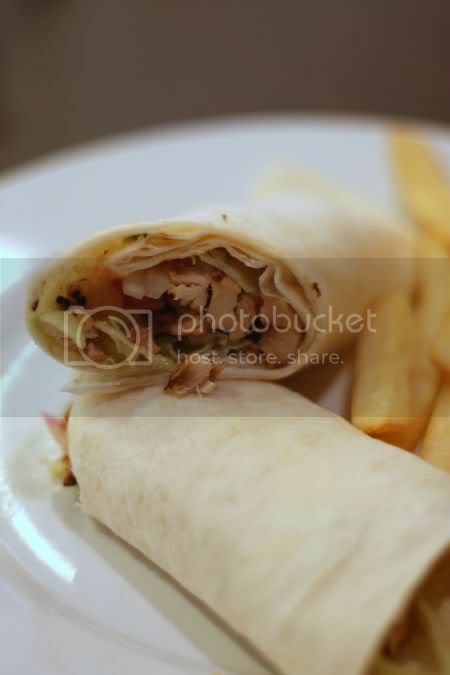 I like the flecks of wasabi on top of the tuna slices that wrap the delectable cold pasta. 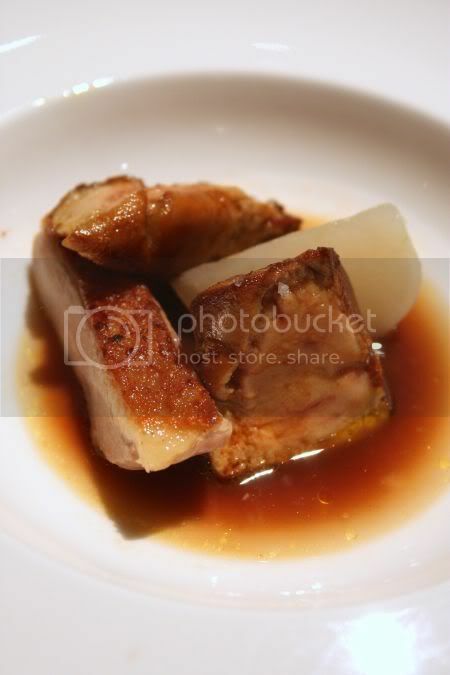 I was equally impressed with my next dish - the roasted foie gras. Literally melting in my mouth, the creamy foie gras was excellent and something I have never tasted before. It felt a bit weird though, paired with duck and the kabu, a type of Japanese turnip. 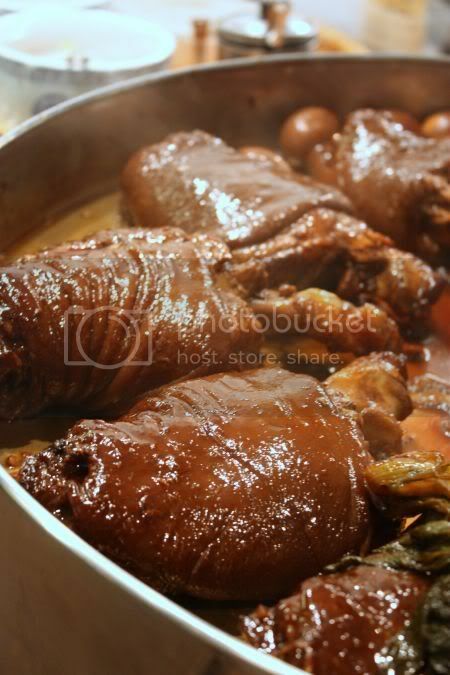 However, the duck jus (from the roasting) pooling on my plate was good stuff. Nothing could stop Splashie Boy from ordering beef - the rump steak served with carrot puree and anchovy sauce. 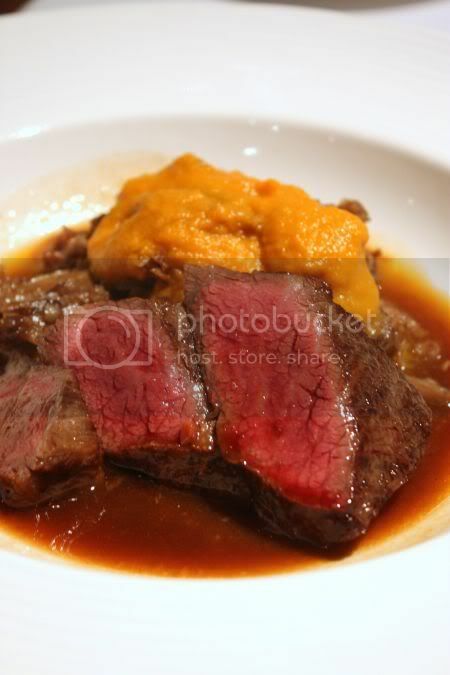 Cooked medium (the way he likes it), there are 2 parts to this dish - the sliced beef rump and fork tender beef topped with the carrot puree. I didn't taste any anchovies though so it may be quite subtle or just not in the spoonful I had as a sample from Splashie Boy. 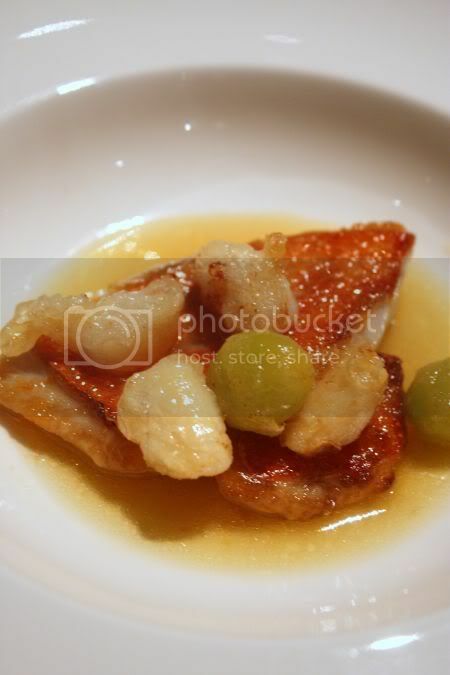 I had a lot of catching up to do, since I had more courses - a pan fried fresh fish (suppose to be Suzuki Seabass but it was not available) served with a slightly chewy kobashira, a type of clam and greenish tinged gingko nuts. I liked the light taste of the dish paired with the very delicate flesh of the fish. 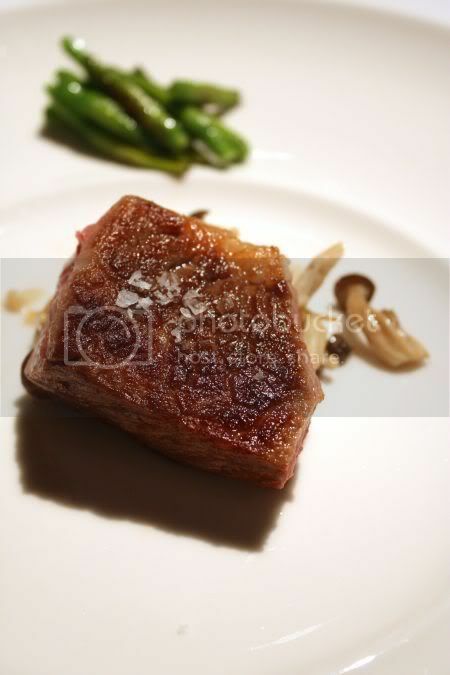 Next was an perfectly charred Wagyu beef (nicely charred with a crust) but still medium inside. 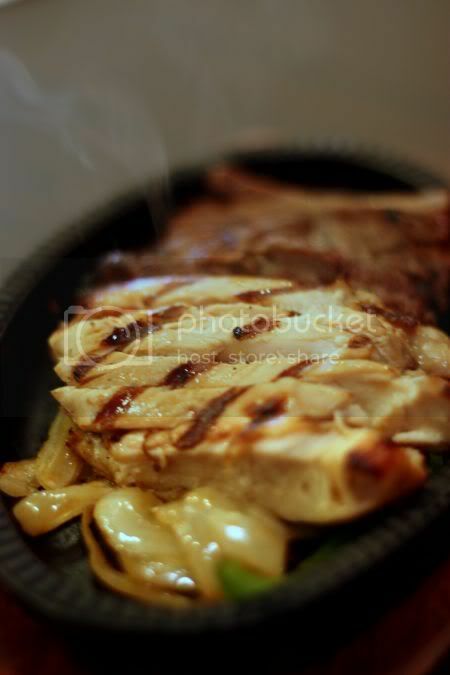 It is served with a spicy and citrusy yuzukushou (yuzu mixed with green chillies) and sauteed mushrooms. Really good stuff, which I quickly finished as I was lagging behind Splashie Boy. 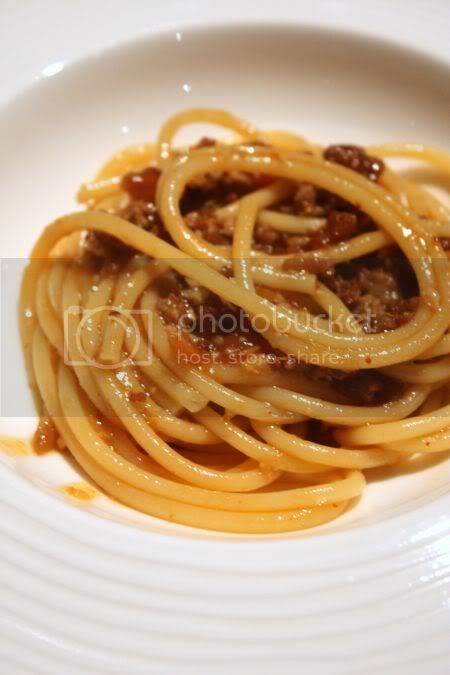 Last but not least was the bucatini pasta tossed in a rich earthy tasting and spicy lamb ragout and piment chili. 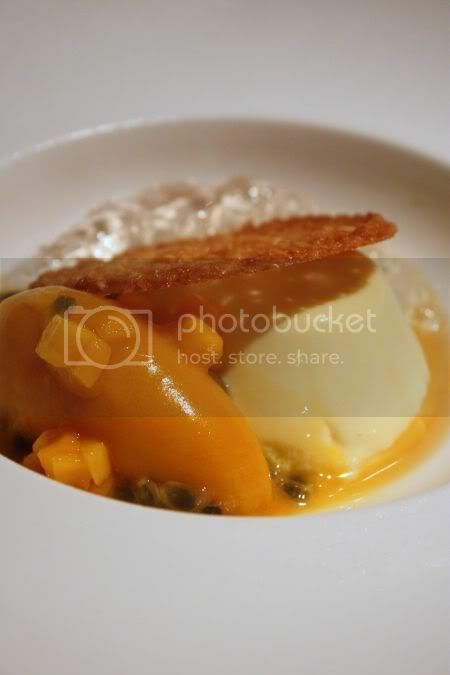 Just before my dessert, I was served a palate cleanser - sweet cubed rock melon with a cold tangy sorbet. 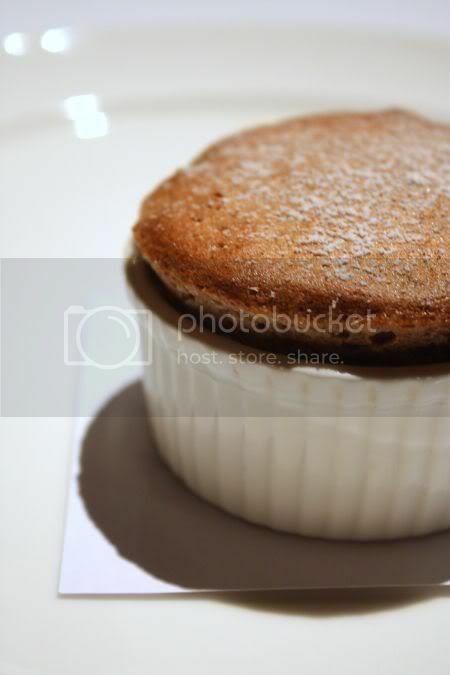 My dessert - the chocolate and cointreau souffle was nothing fantastic and tasted kinda ordinary to me but Splashie Boy's highly recommended almond blancmanger was excellent. The waiter recommended this for dessert hence we knew it must be good plus we heard rumblings from Lyrical Lemongrass on how good it was. At first I thought the transparent pieces on the side was ice cubes to keep it cold - a closer examination of it revealed black specks. Turns out it is vanilla gelatine. Really delicious when paired with the creamy blancmanger (that kinda reminds me of an excellent just wobbly panna cotta), mango sorbet and tangy passion fruit. I didn't get to try the wafer, since Splashie Boy chomped it all of as he loved it. 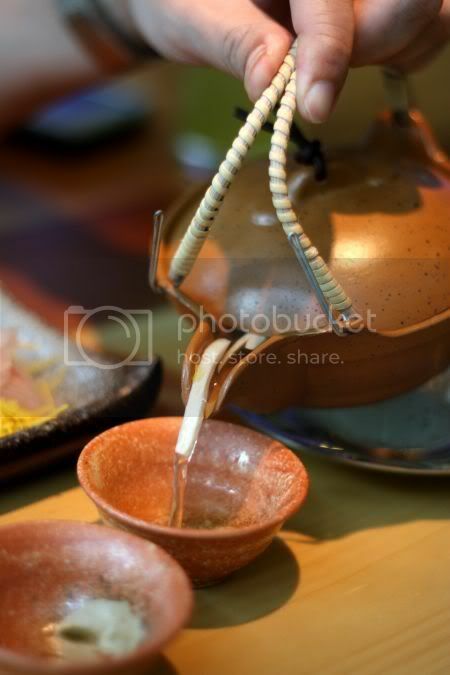 We were served tea after that with little biscuits. While some items didn't impress me, I thought on an overall basis I was very happy with what I got especially the roasted foie gras, wagyu beef and the lamb ragout pasta. Splashie Boy also loved his food. Both of us felt, for what we ate was excellent value for money. Definitely better I reckon from the other gourmet places in town. Another very big plus point is the excellent service and the best thing is, the waiters can answer my numerous questions here. I guess you can see me making more excuses to return here for lunch and dinner more often.